• working women who are struggling to "do it all"
Your time has come to take a leap of faith. Join me as we surrender our fears, end the chase for perfection, and say yes to cultivating the meaningful lives God desires for us. You know all those things you've always wanted to do? You should go do them. When I was in college, I discovered the Southern Weddings blog and magazine. I was captivated by Lara Casey's story - the business she'd built, the beauty she was curating and the faith she shared. I'd never been the kind of girl to dream about my wedding day growing up. But there was something about the space she'd created that captured my heart and imagination. Although I've since gotten married, I buy myself a copy of Southern Weddings every time they release a new issue. And yes, I still read the blog... I just can't help myself! So, I was thrilled when I found out that Lara was releasing a book. I jumped at the chance to read and review it on my blog. 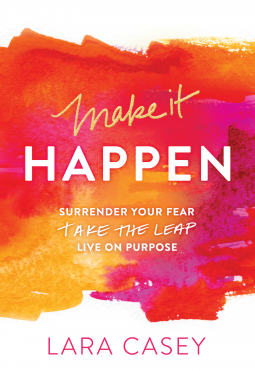 Make It Happen is both a memoir and motivational workshop. As Lara writes in the introduction, it's not just "a reading-only book." In parts 1 through 3, she shares her personal story. This part of the book is more like a memoir. And Lara isn't afraid to share some hard things about her journey. She takes an honest look at her past - the successes and the failures. Included through these chapters are application sidebars and "Take Action" sections to encourage you to respond and personally connect to the truths she's sharing. Part 4 is called "Your Guide to Make It Happen." It's a workbook-stye action guide with practical steps you can take to surrender your fear and start living out your purpose. There were a lot of things I liked about Lara's book, especially Lara's honesty and openness. She's vulnerable in these pages, and I know that takes a lot of courage. I also love that God is at the heart of everything she's writing. This isn't a self-help book telling you that YOU can do it all in your own power. It's a book about faith, facing your fears, surrendering control and living out your purpose. It's a book about adding meaning to your life - not just doing more. However, the message did feel a bit repetitive at times. I must also note that I don't think this book is meant to be read on an e-reader. I feel like I missed out on a lot of the value of this book by reading it on my Kindle. You can't mark up an electronic copy in quite the same way! And I kind of skipped over the workbook section. I'm not a huge fan of books where you fill in sections and answer questions, but that's just a personal quirk of mine. Either way, however, I don't think the e-book is conducive to the kind of interaction and journaling that Lara is hoping to inspire. So, if you decide to read this book, I'd recommend buying a physical copy! I'd hoped that I'd love this book because of how much I admire Ms. Casey, but I ended up just liking it. Now, I'll admit that it could partly be due to the fact that I didn't interact with the book by answering the questions and filling in the workbook sections. If you like that type of book, and are looking for some encouragement to take a leap of faith, I think you'll appreciate what Lara has to say. "It is often said that a great marriage takes work. This is true, but the work of marriage is the work of surrendering - taking giant leaps of faith and working hard every day to love on purpose. It's the kind of work that multiplies and hope in others too." What intrigues me the most about Make It Happen is how you've mentioned that it integrates faith. It's always important to face your fears, to try to do things that will further you living your purpose, to have faith. I generally love self-help books like this, where the author shares her story and some advice. Might have to check this out!